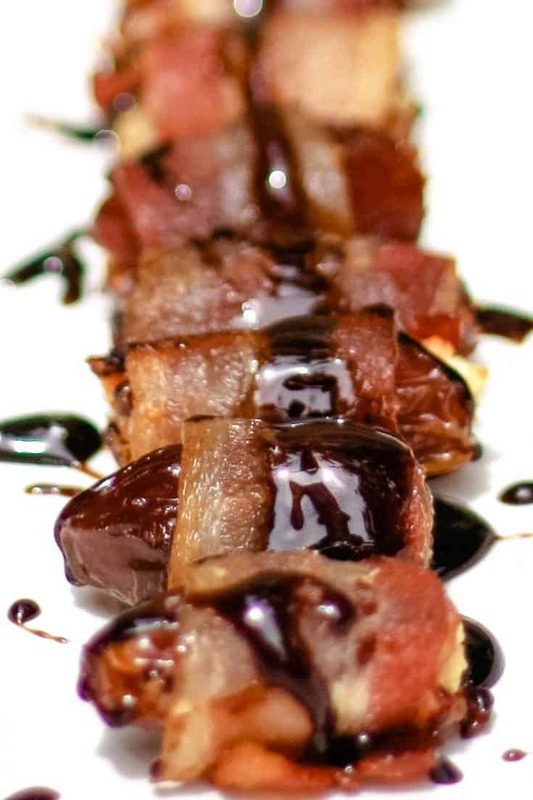 Bacon wrapped dates topped with a honey balsamic reduction – fancy finger food! This is the perfect party appetizer. I have a bunch of recipes that have always been my go-to’s for parties or potlucks. I’ve shared a few with you guys before – my taco dip is a fan fave for sure and this veggie dip is a family favorite. Lately though I have been changing it up a little bit. Bacon wrapped dates are where it’s at. I’m sure you have seen them before – in fact, you have probably eaten them before. Unless you hate bacon. Haha, that’s a good joke right? 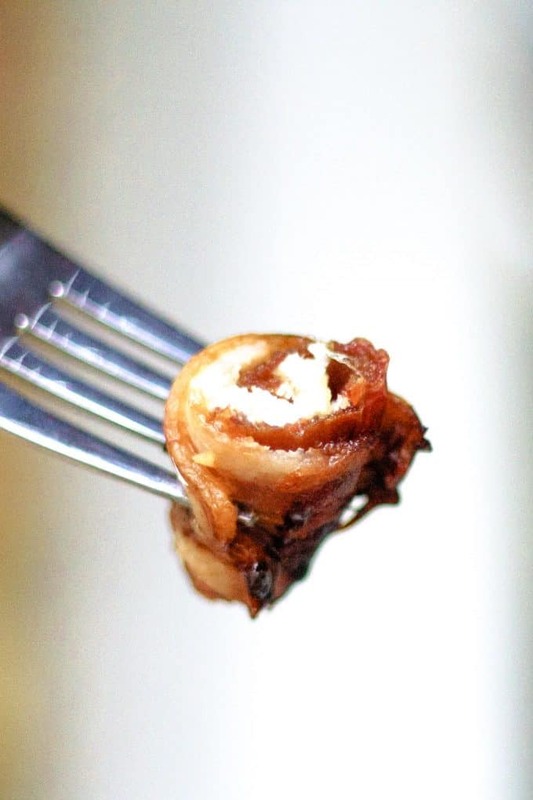 Bacon wrapped dates are one of the easiest finger foods to make yet still look slightly complicated. I dribbled a delicious, yet easy-to-make, honey balsamic reduction all over the dates to make them extra fancy. For my sister’s birthday party over the weekend, I made a double batch. Somehow one lone date got left behind – the other 59 were swallowed up quickly. For these pictures and the measurements of my recipe, I used smaller, pitted dates. Keep in mind that if you use the larger type of date (I believe the medjool) then you should cut your bacon in half instead of in thirds. Also, you may need to double the amount of filling. If you are feeling experimental, substitute the goat cheese for crumbled blue cheese. I tried out both versions at a party I threw for a friend and the goat cheese version was devoured quicker than the blue cheese version. 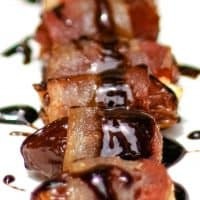 If you are short on time, cut out the honey balsamic reduction and serve this bacon wrapped date recipe without it. 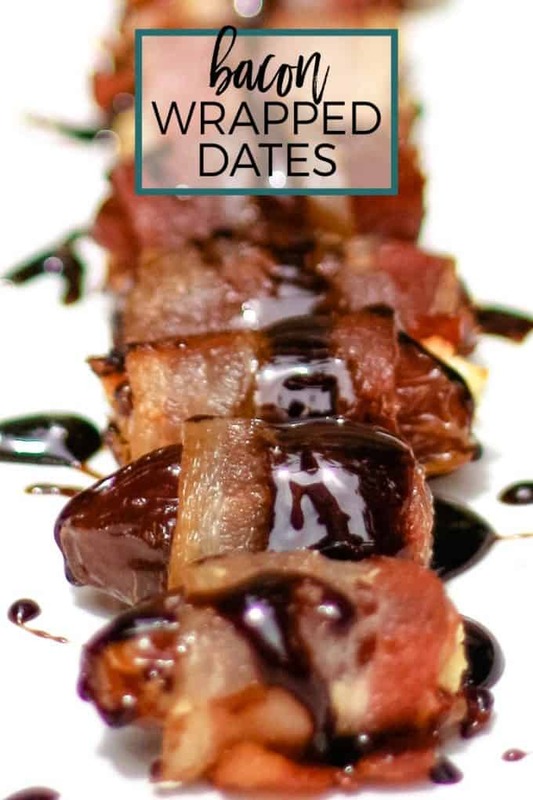 I can testify that the dates and bacon alone is a delicious combination. 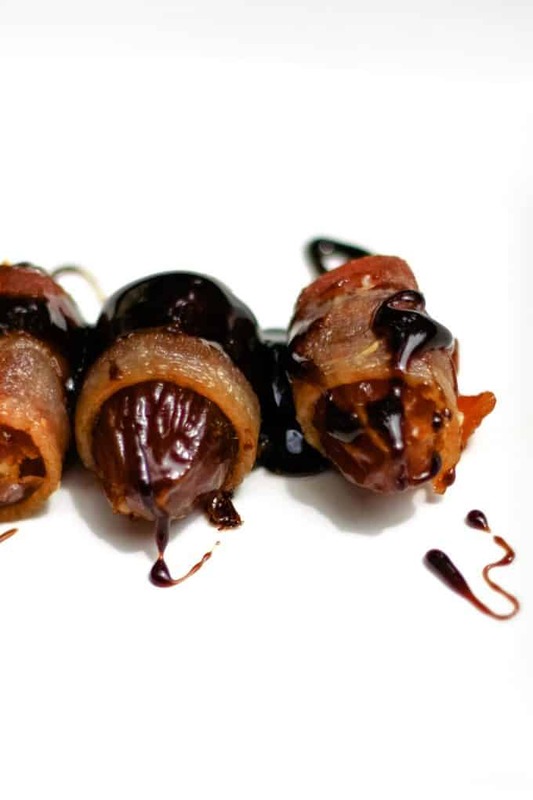 Bacon wrapped dates topped with a honey balsamic reduction - fancy finger food! This is the perfect party appetizer. 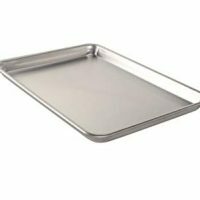 Preheat your oven to 350 degrees and cover a baking sheet with foil. Combine the goat cheese and almonds in a small bowl. Mix well. Stuff each date with the goat cheese mixture - you want to stuff them so they are full but not overflowing. Wrap a piece of bacon around the date so that the date's opening is covered - stretch the bacon if you need to. Place the bacon covered date on the baking sheet, with the bacon edges on the bottom. Repeat with all the dates/bacon, spacing evenly on your baking sheet. Bake for 20-25 minutes, until the bacon is crispy, and remove from the oven. Let cool completely before serving. While the dates are baking, combine the honey and balsamic vinegar in a small sauce pan. Cook on medium heat for 15 minutes, or until combination is reduced by half. Stir occasionally. Remove from heat and let sit to thicken. Looking for more fun appetizers? Try my antipasto skewers or this corn dip recipe! You can never have too much taco dip. These were great. Never had dates in my life. I was at both parties and ate them both times. They’re a must try. 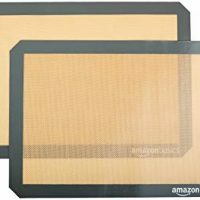 You will love them and your guests and they will be a hit. Thanks Mom (full disclosure – this is my mother.) I’m glad you liked them – I like them a lot too! These look so good!!! Thank you for sharing the recipe. I’ve never had bacon wrapped dates before. they sound and look delicious! Do people realize they are dates? Most people see the bacon and just eat. Lol, I don’t know if everyone realizes they are dates, at all. HI! Thanks for linking up to the Tasty Tuesday linky party last week. I have pinned your recipe to the Creative K Kids Tasty Tuesday Pinterest board. I hope that you’ll join us again this week! Would this be good without the cheese and almond stuffing? I am sure it would be good – bacon wrapped dates are always delicious!